Well, I admitted defeat on my first attempt at making my Inverness Cape, having tried to make it from some wholly unsuitable fabric. These things happen from time to time. It did throw my confidence and flow in getting it done though, so it’s been a good ten months before I’ve picked it up again. 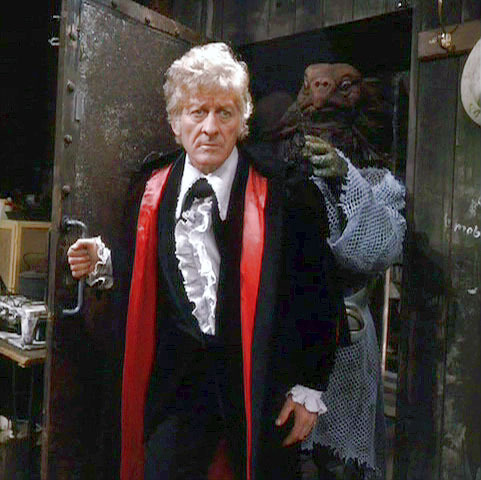 My plan now is to make one of the other, and more commonly seen Inverness Capes worn by Jon Pertwee (see left). 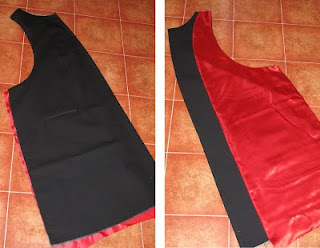 This time round I am using a much better set of fabrics: a black gaberdine; and a red satin lining (see right) and I’m fired up to get it done – and done right! So, I start by making some minor revisions and amendments to my pattern, which I’ll mention as I go along. Once these are done I can begin cutting, starting with the back. This is fairly straight forward, though I have made the allowance for the lower split a little more generous than before. I need two panels in the black (see left, top tow pictures) and two more cut in the red silk lining (see left, third picture down). Both times I mark it out with chalk before cutting. I also cut the wings (see left, bottom picture). Last time I cut a separate strip to face the under edge of the wing, and subtracted this from the lining. This put a seam on the leading edge of the wing, which I felt made it feel a bit heavy. This was a mistake in hindsight. This time round I have cut the body of the wing with facing folded from the top of the wing. Again this is subtracted from the lining. You can see this in the photo, where the lining is placed on top of the wing, showing the shortfall on the right side. First bit to be put together is the back. 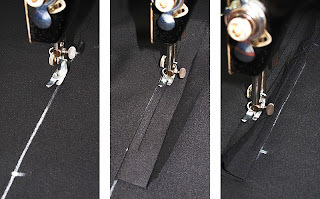 It’s a simple assembly job, just sewing the back seam down to the point of the split, being a good inch or so below the top of the seam allowance (see below, left). The same is repeated for the lining, to exactly the same depth (see below, right). Both the back and the lining are firmly presses flat for the height of the sewn seam (see below, left). Now, the next bit is very hard to put in words, but basically for the body of the back, one side is folded and pressed from the centre seam; and the other overlaps underneath, turning a minimal seam allowance on its long edge. The lining is matched along the centre seam, and is attached to the back, dog-legging at the top, making for a neat finish (see below, right). 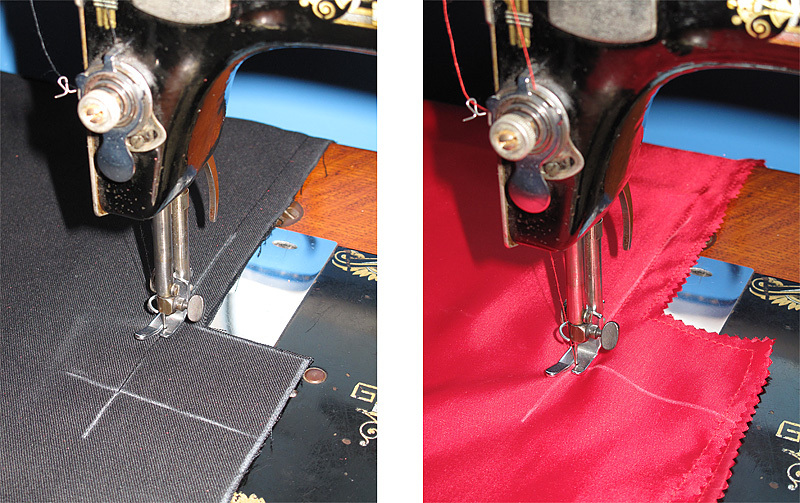 The front panels of the cape are relatively easy compared to some of the work I have done. The body of the front has been backed with calico to give it support, but not make it too stiff. I have then cut two narrow front facings, which at the top will form a sort of lapel. These I have interfaced with fusible canvas as I do want them to be a bit firmer. These facings are then subtracted from the net size of the front to produce the pattern for the lining, after adding seam allowances. Before sewing the lining and lapels I need to set an outside welted pocket on each side (see left). This I keep nice and simple. I won’t go into masses of technique here, as I have covered this type of welted pockets in the Suit Blog, but first I mark my postion in chalk (see far left); then sew a single-piece welt with two lines of exactly parallel stitch (see above, centre & above, right). Once cut and turned this makes for a crisp, tight welt. I then need to line the fronts, which is unusual at this stage of a garment assembly. The lining is made up of a lapel and facing which has been stiffened with some interfacing, attached to a lining fabric to cover the remaining area of the front panels (see right). This is simply attached around the under-armhole and the lapel front edge (see left). This now finishes the isolated parts ready to assemble into the finished cape. Check back soon to see how I get on! I have been waiting a long time for this, as this is my favourite of the third Doctors capes. Hope you might be thinking of offering them to buy at a later date? Good luck Steve.